When you're putting together a smart home, it's easy to get a little carried away. Maybe you start with a speaker connected to a voice assistant. Then you're ordering pack after pack of smart light bulb, wiring in a doorbell cam, and before you know it your curtains and blinds are opening all by themselves. Well, homeowners aren't the only ones going down this path, we've also seen the companies behind these devices start out making just one kind of smart-home accessory, before finding themselves building a whole home's worth of connected tech. You may be familiar with Ecobee from its smart thermostats, and now the company's expanding with the release of the Switch+ smart light switch. Ecobee first announced the Switch+ earlier this month. While on the surface it's a smart light switch, the Switch+ does a whole lot more than just let you remotely control your home's illumination. 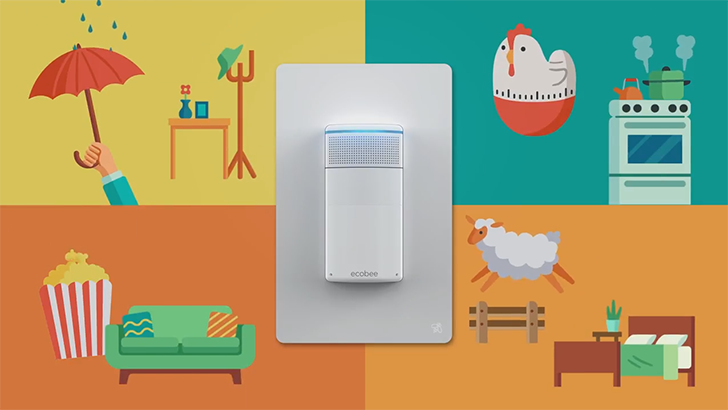 Its big feature is voice control, which extends far beyond simply controlling the state of your lights to offer full Amazon Alexa connectivity. With enough of these in your home, and thanks the far-field mic tech built into the Switch+, it's conceivable you could access Alexa no matter where you are: kitchen, bedroom, bath—wherever. Beyond just controlling your lights with voice commands, Switch+ owners can also take advantage of the hardware's sensors to automatically manage illumination, detecting daylight and motion. And while you're free to use the Switch+ by itself, it's also got a temperature sensor you'll eventually be able to connect to an Ecobee thermostat. Retail sales of the Switch+ get underway today. You can expect to pay just about $100 for the smart light switch.